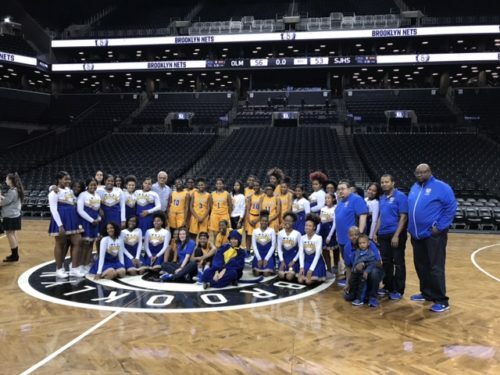 The St. Joseph’s H.S., Downtown Brooklyn, varsity girls’ basketball team played a Valentine’s Day game against Our Lady of Mercy Academy, Syosset, L.I., at Barclays Center, the home of the Brooklyn Nets. Student-athletes and their families enjoyed the Nets vs. Indiana Pacers game later that evening. 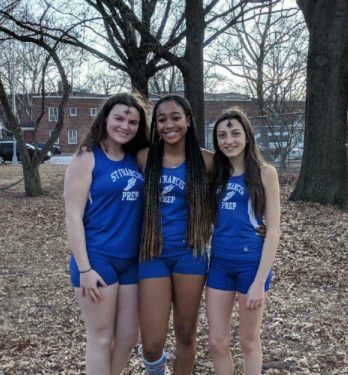 From left, St. Francis Prep track stars Stephanie Zovich, Trinity Smith and Chiara Cinquemani. Senior and two-year team captain Trinity Smith finished first in both the city and diocesan 55-meter high hurdles with a time of 8.54. She also won the 55-meter dash with a time of 7.44. At the State Championships, she turned in a time of 8.51 in the 55-meter high hurdles to capture the title. In December, Smith set the school record in the event and then broke her own new record four more times throughout the season – with her personal best being an 8.22 at the Ocean Breeze Freedom Games in Staten Island on Jan. 7. She is set to compete in nationals this month. Other impressive performances from L’il Terriers at intersectionals include junior Stephanie Zovich, who took home city and diocesan titles in the shot put with a distance of 27-feet, 5-inches, and junior Chiara Cinquemani, who won the diocesan 3,000-meter championship for the second year in a row with a time of 11:22.97.